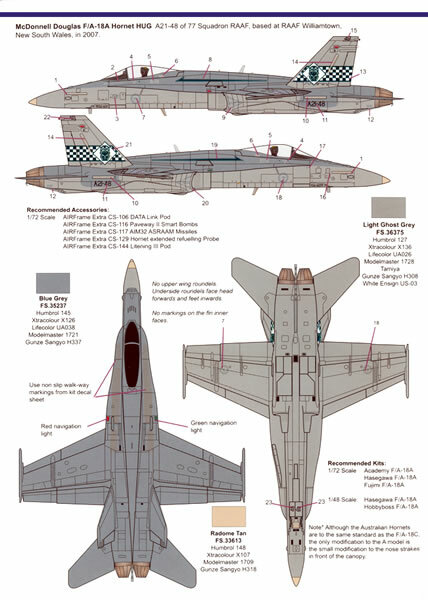 48-189 is a recent addition to the Model Alliance Premier Range of decal sheets. It is a mixed sheet in that it provides markings for aircraft operated by five different countries. McDonnell Douglas F/A-18A Hornet HUG (Hornet Upgrade) A21- 48 of 77 Squadron Royal Australian Air Force based at RAAF Station Williamtown, New South Wales in 2007. The aircraft is in the standard scheme of FS35237 blue grey over FS36375 light ghost grey with FS36375 light ghost grey vertical stabilisers. 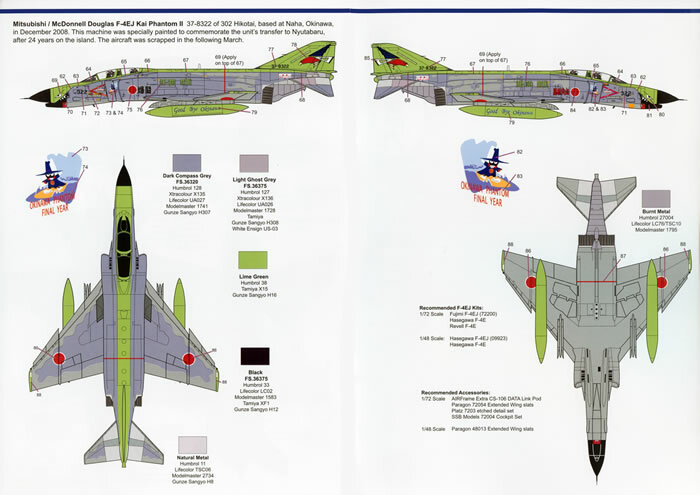 The machine wears what is termed the “Grumpy Monkey” Display Scheme comprising the squadron’s green “spear” on the fuselage with a band of green and white checkerboards chord wise across the outer surfaces of the vertical stabilisers with the “Grumpy Monkey” within a white diamond. The “Grumpy Monkey” is actually a Korean lion which 77 Squadron adopted as its squadron marking from its time in Korea during the Korean War. Apart from the squadron markings you also get individual serials as well as national insignia, “slime lights” and a limited assortment of stencil data. The aircraft’s pilot’s name (Wing Commander Allan Clements) is also supplied. Sikorski VH-3D Sea King, Bureau number 159351 of the Executive Flight Detachment of HMX-1, based at Marine Corps Air Facility Quantico (MCAF Quantico), Virginia, in 2008. The machine is finished FS14079 “Presidential Olive Green” with a white top to its fuselage. This is a great set of markings if you want to model a clean and glossy machine as they are kept this way befitting their role as a VIP transport. 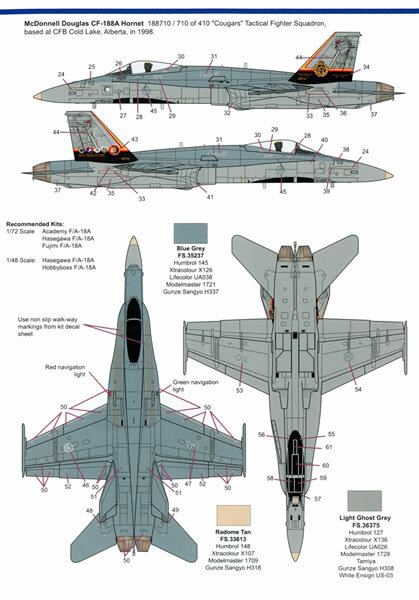 All the white pin-striping is supplied as decals as are as the areas painted black to “hide” the engine exhaust stains, the national insignia, the squadron badges and the US flags. McDonnell Douglas F-4E Phantom II, 68-0374 of 172 Filo "Falcons", Türk Hava Kuvvetleri (Turkish Air Force) based at Erhaç-Malataya Air Base, Turkey in 2008. 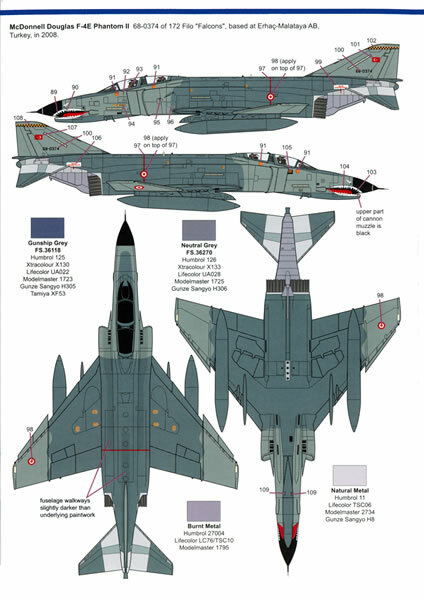 The F-4 is in the twilight years of its service but is expected to serve with the Turkish Air Force until at least 2015. The depicted machine is in a FS36118 gunship grey over FS36270 neutral grey camouflage scheme which is all but negated by the addition of a large shark-moth marking. Other markings include a black and yellow checker board across the base of the fin cap and a Turkish flag on the vertical stabiliser. A full set of national insignia as well as serials is provided along with the previously mentioned markings and a very limited set of stencil data. McDonnell Douglas CF-188A, Hornet serial number 188710 of 410 Squadron "Cougars" Tactical Fighter Squadron Royal Canadian Air Force in1998. The machine is in what was termed the 'For the Liberation of Europe' commemorative scheme. Basic camouflage scheme is FS35237 blue grey over FS36375 light ghost grey with FS36375 light ghost grey vertical stabilisers. The commemorative scheme markings are applied to the outer surfaces of the vertical stabilisers and these are supplied as one-piece decals. Other decals for the option include a ‘false canopy’ for the underside of the nose, a set of national insignia, a set of ‘slime lights’ and a limited supply of stencil data. Mitsubishi/McDonnell-Douglas F-4EJ Kai Phantom II, serial number 37-8322 of the 302nd Hikotai, based at Naha, Okinawa, in December 2008. This machine was specially painted to commemorate the unit’s transfer to Nyutabaru Air Base, in the Miyazaki Prefecture of Japan after being based on the island of Okinawa for 24 years. The basic camouflage scheme is FS36320 dark compass grey over FS36375 light ghost grey to which great swaths of vivid light green has been applied. 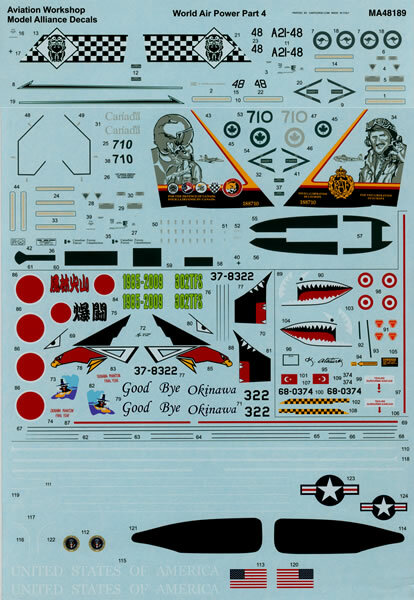 The machine also sports a shark-mouth marking and nose art consisting of the “Spook” figure riding a surfboard and various scripts in both the English and Japanese languages. A full set of national insignia is included as are the thin black lines that edge the lime green markings. A very bright option! The decals themselves are very good quality and produced by the silk screen method by Cartograf. They are thin and glossy and have very little carrier film surrounding them. The colours all appear to be correct including the elusive green used by 77 Squadron for their markings. 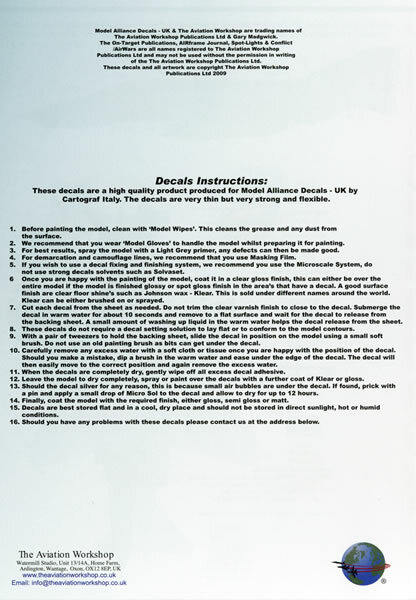 Please be aware that I have purposely darkened the image of the decal sheet so as the white portions show up, they are true to life on the sheet. 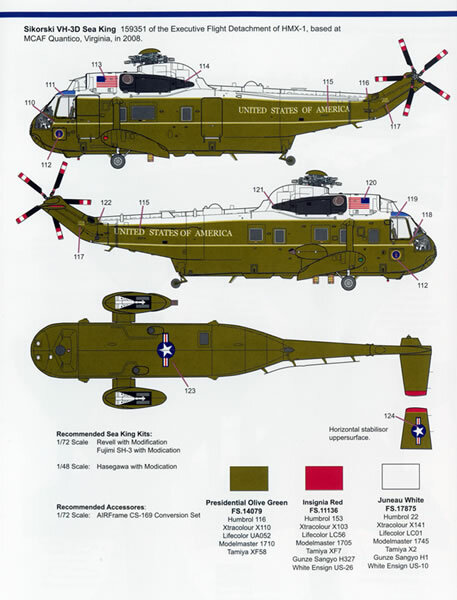 The register is spot on including the very intricate Seal of the President of the United States markings worn by the Sikorski VH-3D Sea King option. The sheet itself is very large indeed measuring roughly 8½" wide x 12½" high (215mm wide x 318mm high). The placement guide comes in the form of an eight page booklet (5¾" wide x 8¼" high) that provides a separate page for each option. 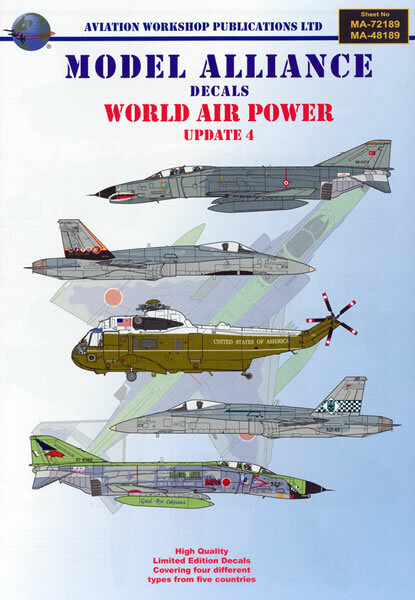 The JSDAF F-4 gets two pages! Each page holds four view full colour illustrations of each machine as well as information as to what kits are available of the machine in both 1/72 and 1/48 scales as well as matches of the colours to readily available model paints – Humbrol, Xtracolour, xtracrylic, Lifecolour, Model Master, and Alclad and a list of applicable AIRFrame Extra after-market accessories. All up an excellent sheet from Model Alliance Decals that supplies you with a very wide range of subjects and first rate decals and support material.